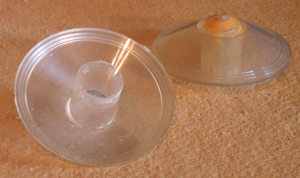 It is in a bit of a sorry state, but structurally it is sound. The inside was decorated with normal standard house size paper, and carpet, I think it must have had a rabbit living in it, say no more. 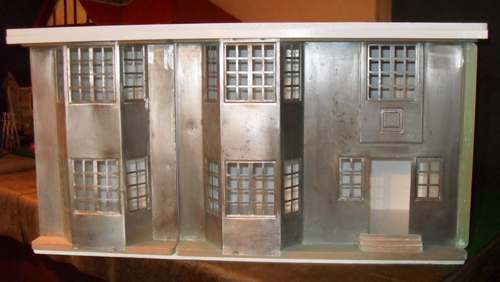 The outside has been overpainted, and parts of the decals are missing. It does not show much signs of rust though. The door is also missing. 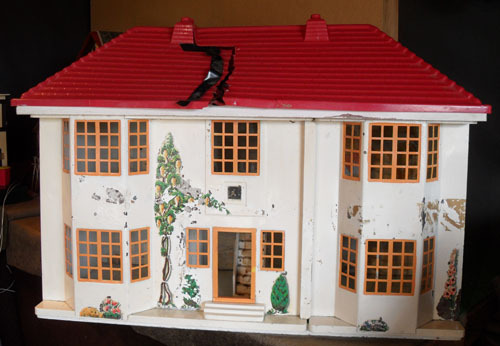 The windows have been overpainted in orange,the house must have been secured with parcel tape at some time, this is the worst thing to use, as if it is left on for any length of time it is very difficult to remove without causing damage to the paintwork. The house must have been secured with parcel tape at some time, this is the worst thing to use, as if it is left on for any length of time it is very difficult to remove without causing damage to the paintwork. This is the inside of the house with the walls partly striped and the carpets removed. 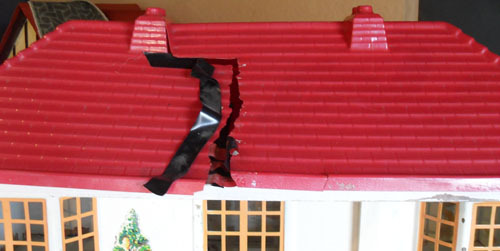 The roof is damaged on one side, but the other side is ok, I am not sure how I will repair this. I might just tape it up neatly. The other side is alright, so I could get away with turning the good side to the front. 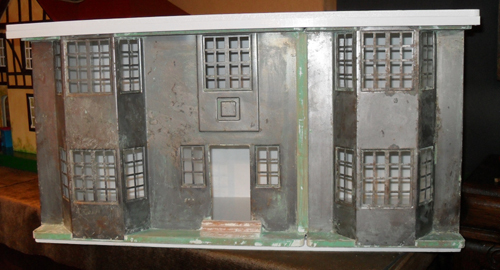 The paint has been stripped from the dollshouse and the metal sliding front. The metal front will take a bit of time to remove the rust, and prepare a good surface to paint on. The metal had an undercoat of green paint, which I was surprised about. 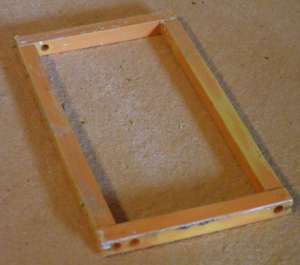 The window frames were left this colour and the white top coat covered the rest. These lights fit into the holes in the ceiling, shown in picture above. 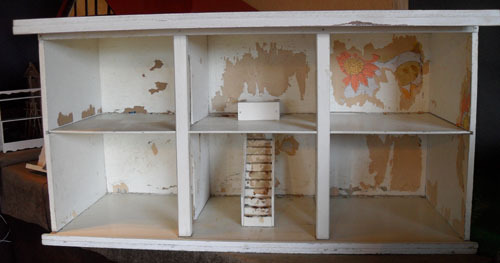 The stairs have been removed from the house stripped and taken apart, ready for painting. I have removed the door frame, to avoid it being damaged by the paint stripper. 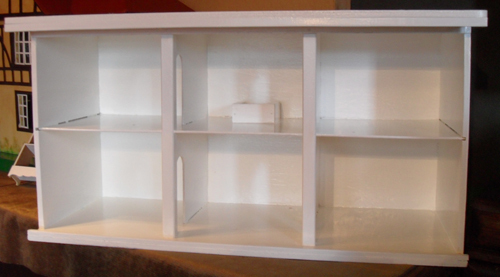 The wooden shell of the house has now been painted, with white gloss paint. It looks and smells much better. It took a long time to take off the paint, down to bare metal, removing all the rust spots and treating them with rust gel. 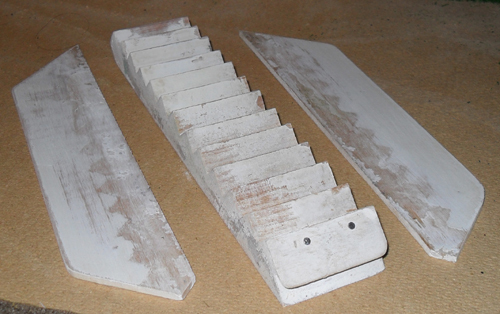 I used a white spray paint for painting radiators for the front of the house, as it gave a good smooth even finish.